When employees become your second family, find a way to make them feel appreciated this holiday season with a special gift from The Foursome. The Holidays are a great time to give thanks for those that work beside us every day. A gift card to The Foursome is a genuine way to show your male employees and clients they are valued and appreciated. The gift of confidence goes a long way in creating a successful business culture! How about something more personal? Give your top employees or clients a premium writing instrument from Faber-Castell. Monogramming and logo printing available (with 4-6 weeks lead time). Contact Michael at The Foursome for information, michaele@thefoursome.com. Or something that’s practical and fashionable? Tell us your budget and we’ll create customized gift boxes of fashion socks for men! A fun and memorable gift he will enjoy wearing all year long. We are happy to take special requests or help with more ideas! Call us at 763-473-4667. The hum drum of this Minneapolis bound plane sparked a few thoughts for you traveling business people out there. Nothing profound, mainly observations and a few packing tips. This may seem obvious, but wrinkle-free clothing is your best friend on trips. At The Foursome, we sell wrinkle-free dress and sport shirts by Enro, Forsyth of Canada, and Overton. All of these are great options for a sharp business look. For pants, I suggest our Riviera “travel pants”. These flat front, wrinkle resistant, machine washable pants are made of a wool/polyester/lycra blend that wears and packs well. They are genuinely comfortable and even have a “Passport Pocket” for personal belongings. I recommend trying a pair of the Riviera five pocket pants in black, a more modern alternative to a regular dress slack. Talk about something that gets good mileage. Easily dress them up or down, wear to a meeting, out to dinner, or on the plane. Enro and Savane pants are also wrinkle resistant and a great basic option for traveling. If you are an avid business traveler, I am sure you have more tricks up your sleeve than I am aware of. But one thing I realized on my recent trip is that the overhead cabins were too small to fit the average “small” suitcase. Instead of leaving your case in the jetway with a pink tag to pick up after the flight, it seems logical to invest in a smaller bag of sorts and pack light. For an extensive list of more helpful tips than I could ever think up, check out these business travel tips from Executive Travel Magazine. From recovering lost items in your taxi with a GPS system to RIFD-blocking passport cases to Bedbug reports, it is worth skimming to prevent common mishaps and help make your travels a breeze. Can you smell spring yet? Men’s fashion invigorates the senses this season. Fine lighter-weight fabrics remind us of warmer air. Beautiful subtle hue variations in threads create endless color options to accessorize with. Fresh ideas and up-to-date fashions sing like the newly returning birds. The clothing hitting our store this spring keeps getting better and better. 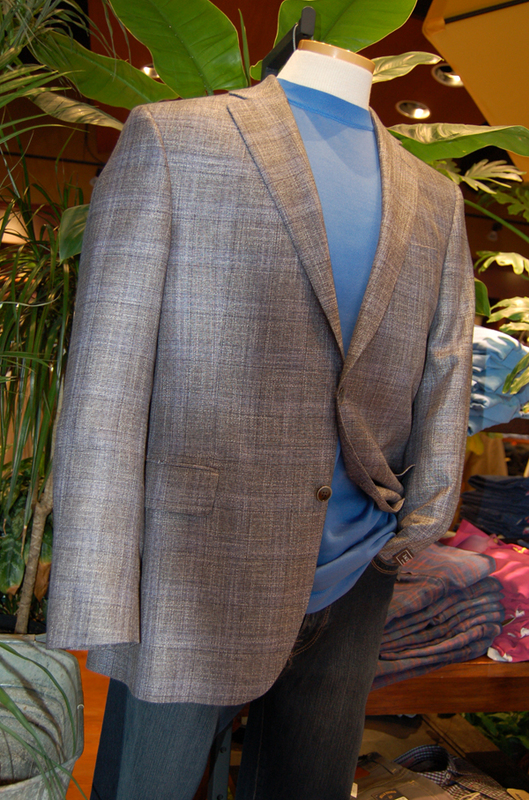 I dress my favorite sportcoat on a mannequin and change it four days later with a new favorite suit. Choosing how to outfit each suit and sportcoat is perpetually fun. Though I am eager to introduce a few new clothing lines, mainstays Joseph Abboud, Hart Schaffner Marx, Jack Victor and Hickey Freeman all have stunning pieces this season as well. Next exciting news on the table is is a clothing line by the name of Byron. With a lengthy list of desirable features and consistent attention to detail, these suits and sportcoats are worth of a try-on. I especially appreciate the modern “British” fit and balanced jacket design. It is tailored to created some waist suppression, has a trimmer sleeve head and a slightly shorter jacket length. Byron boasts of its canvas construction with a floating chestpiece. Sounds superlative, right? Well I had to look up exactly what that means. In brief, there are three types of coat construction. Full canvas construction is handmade with a free-floating piece of material between the jacket’s exterior fabric and interior lining. (Takes forever to make!) Fused means it has a layer of glue or adhesive that completely binds the layers together, creating a stiffer and less natural fitting coat. Between these extremes is (old world) Canvas Construction with a (modern technology) Floating Chestpiece. The canvas provides a proper drape, while the floating (not fused) upper chest ensures a longer lifespan and more natural fit when you are on the move. One surface detail to look for is pick stitching, a simple running stitch that catches only a few threads of fabric at a time. Subtle handwork is a sign of quality in fashion. Click here for a more extensive look at the Byron suit design. I must mention the vibrant neckwear we are seeing. Screaming with color and so very tastefully made. (not too surprising since I have been writing about the color craze in fashion these days, its everywhere.) Our London made ties by Seward and Stern will make you want to walk all over town. They remain committed to the time-honored craft of cutting and folding ties by hand, being one of the few out there to design and color their own neckwear. Geometric and organic patterns to boost your own aesthetic. If the idea of putting on another tie does not excite you, let me clue you into an equally appropriate alternative. The pocket square. Think of it as your new maintenance-free accessory. I am even suggesting it in place of the tie every once in a while. 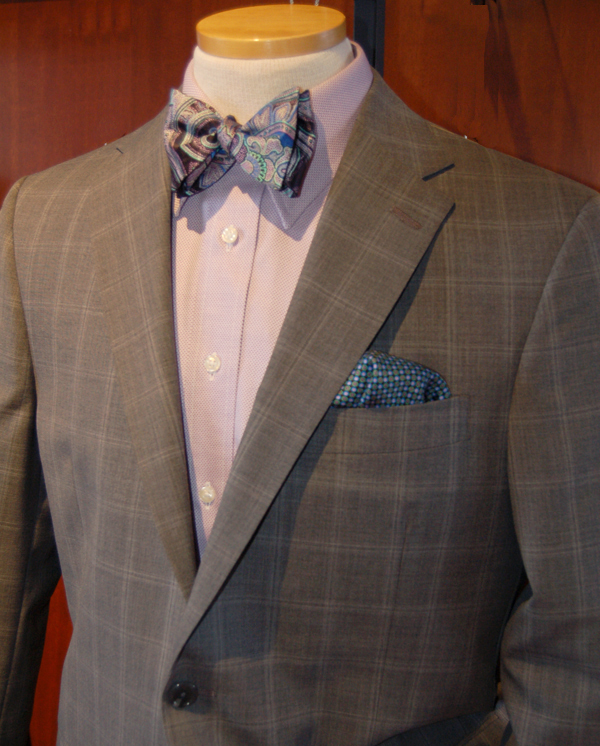 We have a great spring selection with interesting color combinations and patterns. It may break your own rule book but I promise you won’t be the only guy out there doing it. Neutral spools of thread crowded in a shoe box, a row of coats with raw-edged sleeve linings waiting for their turn in the tailor’s hands, snippets of fabric and thread gathered in clumps like hair on the floor of a barber’s shop, a group of shirts draped over a chair ready for pressing. . . 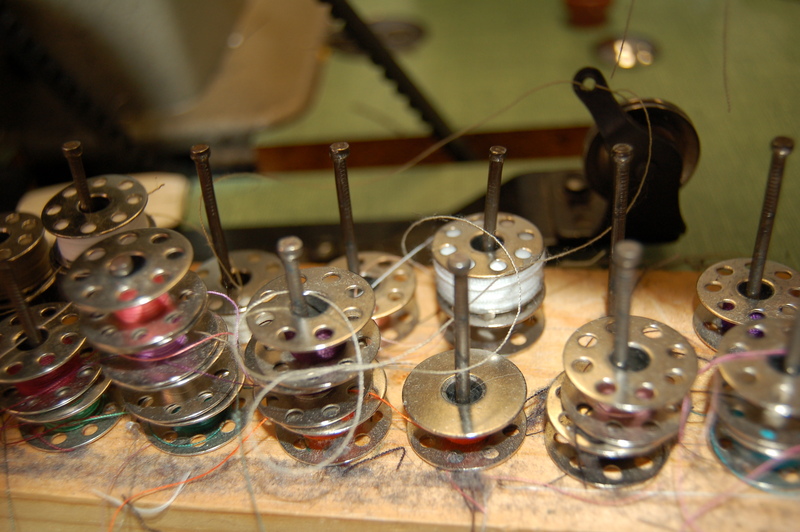 The tailor shop was quiet, except for the low humming of the machine that started and stopped abruptly as Hyo Shik turned the coat he was working on under the needle. He stopped sewing and sat slouched in his chair as he answered my questions. I walked away from our informal interview with a greater appreciation for the quality clothing we sell at The Foursome and learned a number of practical things for helping men discern how their clothing should fit. A few tailoring tweaks to your wardrobe can make a big difference in your personal presentation. 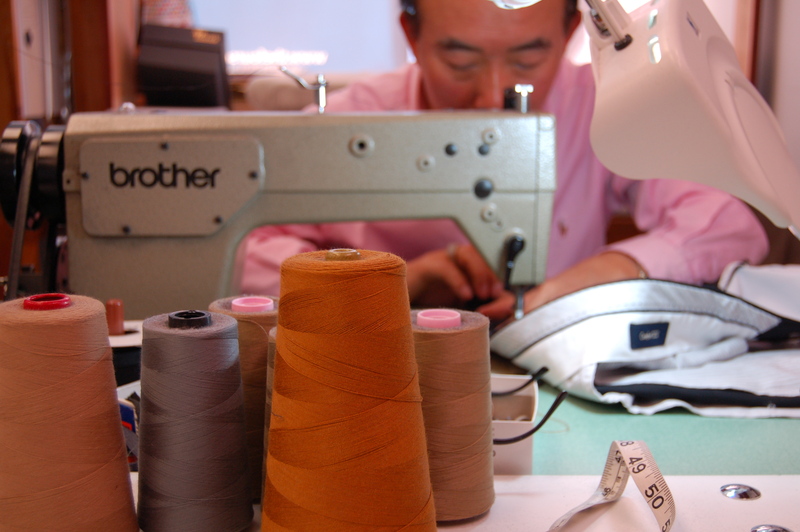 Check out the latest interview with our expert tailor Hyo Shik for helpful tips and a glimpse into how our tailor shop ticks. He has been a part of The Foursome team for 39 years! What do you look for when altering a suit? When I come to a man standing in the mirror with a suit on, I have an immediate judgement. Just by looking I can see how to make it fit right. I look at the man’s body, does he have an athletic body? Does he have broad shoulders? Etc. Each person’s body determines what should be altered. A suit should not pull in any areas, nor should it be loose fitting. A well fitted suit feels very comfortable to the customer when he moves, sits, or stands. What is the appropriate coat sleeve length? Usually 4 inches from the end of the thumb. Some men prefer to show their cuff, which makes it 4 1/2 to 5 inches from the thumb tip. What is the appropriate pant length? I generally determine a man’s pant length by his age. A younger guy, perhaps 35 and under, I mark a 1/2 inch from the floor. But for someone over 50 I want to see a slight break in the pants and mark them 1 1/2 to 2 inches from the floor. However, it is really up to the customer and what length he prefers for his pants. What alterations can be done to an existing pair of pants to help them fit well? For example, when someone has an athletic body, the waist is often smaller and needs to be taken in. The maximum amount that a pair of pants can be taken in is 4 to 5 inches. On the contrary, most pants are made with an extra 2 inches of fabric that can be let out. This will help someone determine whether they should get an alteration done or buy a new pair of pants. How easily can someone change an existing dress shirt into a slimmer fit shirt? We do a lot of shirt alterations in the tailor shop. These days men are wearing slimmer fit dress shirts. A lot of companies have redesigned shirts in this way but we can always tailor shirts to fit well. On average, I would take a dress shirt in 4 to 6 inches. What item of clothing do you think is most often ill-fitting on men? If I were to walk into an event with a lot of men dressed in suits and sport coats, I can tell just by looking how well a garment fits. I can tell what clothing is cheaper and lesser quality because it does not fit well. So it is not just one item of clothing that I notice not fitting well, but the quality of the garment that makes it ill-fitting on men. About how many pants do you hem in one week? We hem 300-400 pants a week so about 60 a day and approximately 25-30 coats a day. What is the most time consuming alteration for you as a tailor? It takes the most time and skill to adjust the collar/shoulder of a garment. I have to start from scratch. It is like making a new piece of clothing because I have to take apart the collar, make adjustments and then re-attach the collar. 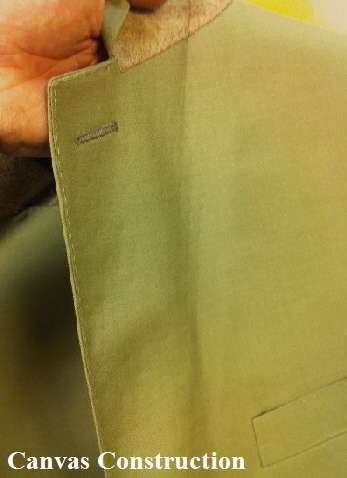 This is why it is important to have an expert tailor who has the skills to do good work. What item of clothing do you enjoy altering most? I most enjoy working with luxury garments like Hickey Freeman and Hart Schaffner Marx because of the exceptional quality of fabrics, linings, and details that are worked into the clothing. I find handmade elements when I open up the suit to make alterations and I appreciate the individual components of these well constructed garments. I have to do less work on them because they are made to fit the body so well. The Foursome offers one of the best full-service tailor shops in the Twin Cities, conveniently located onsite in their men’s clothing store in Plymouth. From complex suit alterations to mending to replacing hardware on garments, our proficient tailors enjoy serving our customers with care. We are pleased to alter both men’s and women’s garments – whether you purchased the garments at our store or elsewhere. See a list of services and competitive prices. A popular business rule suggests you should dress for the job you want, not the job you have. A new year brings resolve to polish up those bad fashion habits and set yourself up for a successful year in both your professional and personal life. By using a little thought and planning, you can achieve a work wardrobe that shows you care about presenting yourself in the best manner possible. When it comes to men and the office, wearing the proper clothing shows helps you feel well suited for any occasion. Whether it be an interview for a promotion, a board meeting presentation, or a meeting with clients – when you dress like a professional you will feel like a professional. Err towards being overdressed. Almost everyone has been there and knows that it’s harder to overcome being underdressed than being overdressed. Choose the right suit. A suit is the anchor of a professional man’s wardrobe. Most importantly a suit must fit correctly. If your weight has fluctuated, proper tailoring/alterations can easily make your suit wearable again. Investing in a well made suit of quality fabrics will pay off over time and will last you many years. It is important to rotate your suits to give them the chance to “rest” between wearing. 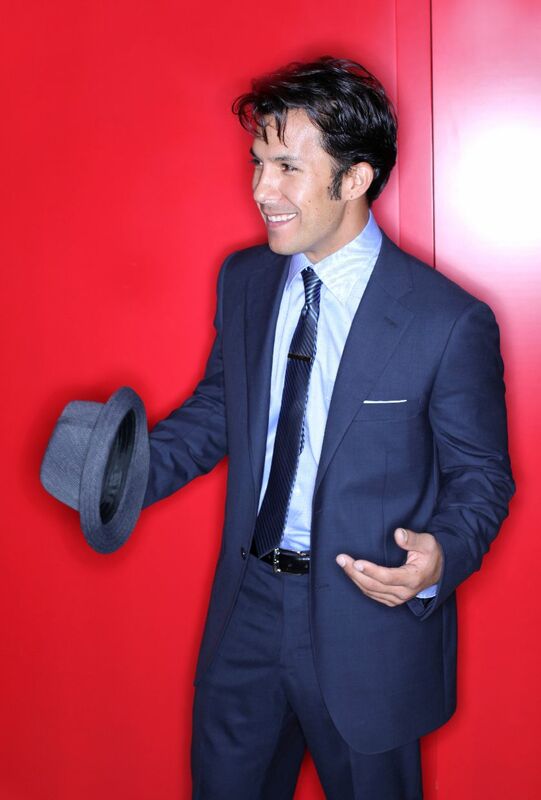 It will benefit you to add a new suit into your wardrobe to allow all of your suits to last longer. 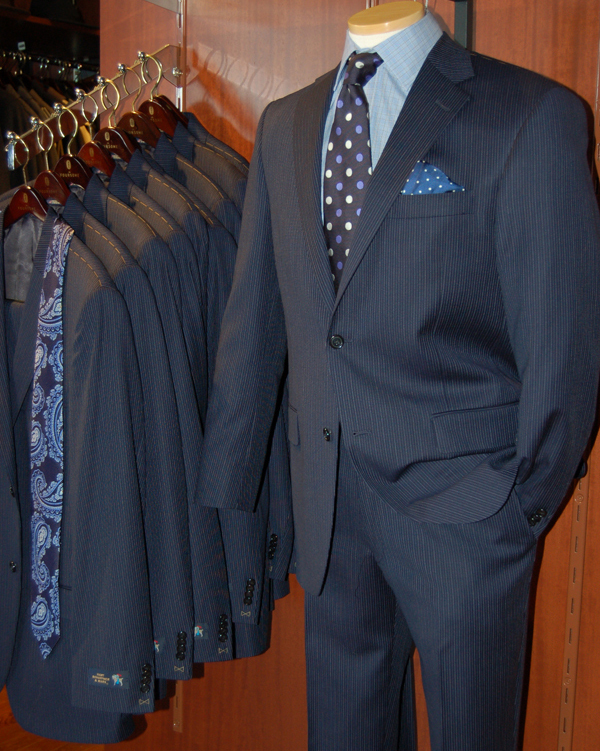 There is nothing boring about a crisp and tasteful navy or grey suit. 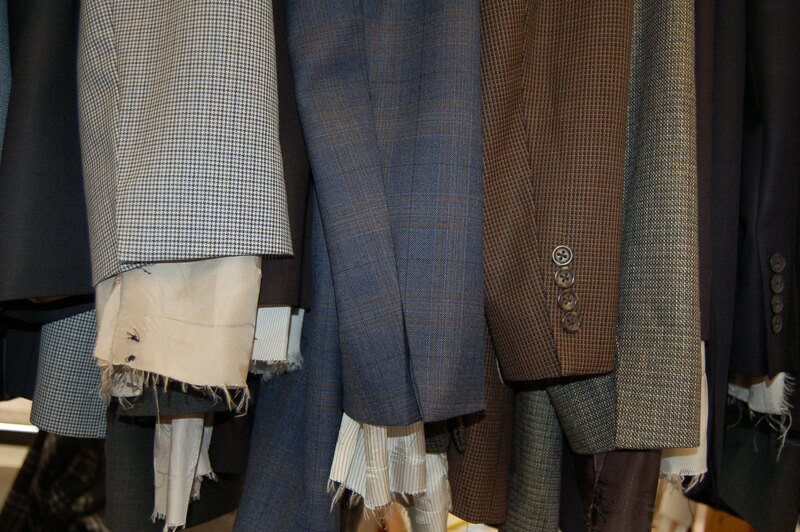 Whereas there is a place for fashion forward suits and sport coats, be sure you have the basics covered first. Accessories are what get noticed. Be sure your shirts are clean and pressed and the collars are not pilling or worn. Collar stays are necessary to give you a crisp look on point collar dress shirts. We suggest Enro or Forsyth non-iron dress shirts for easy care and great everyday wearability. 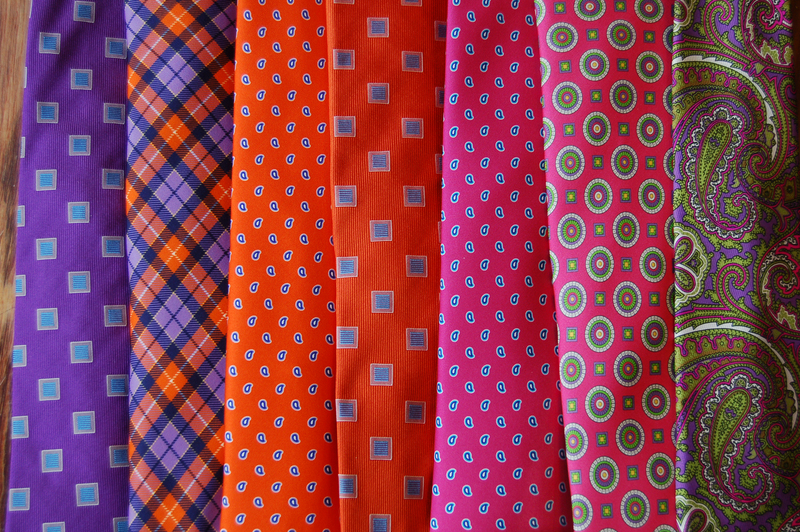 Neckties and pocket squares add the finishing touch to your look and can give a pop of color and personality. Clean and polished dress shoes are a must. Shoes are often the part of a man’s wardrobe that are most neglected (but most noticed by women!). If your shoes are in good shape, take care of them with a brush & polish (we recommend Allen Edmond shoe polish that comes with a hand sponge right on the end! ), replace broken laces, place them in shoe trees when not being worn, and wear rubber overshoes in sloppy weather. Shoes also need proper rotation to extend their life, so be sure you have several black and brown options in your closet. The Foursome shoe store offers quality dress shoe brands like Allen Edmonds, Cole Haan, Ecco, and Florsheim.